In a mere 24-hours, we went directly from summer to fall. And not a nice, cool, temperate fall, but a chilly, humid, and wet fall. The kind that we might have experienced around Thanksgiving, way back when. We knew that cooler weather was coming, but we were quite surprised at just how “cool” cool turned out to be. One of our favorite things about this blog is that it’s given us a way to archive not only our own gardening history, but also that of the changing seasons. Just a couple years ago, in 2016, we had a very strange February, one that started out with snow and turned into full-fledged Spring just a couple weeks later! Now we’re back in a similar situation. Only that the month started off in a deep freeze sans snow, and now, a couple weeks later, we’ve had a warm and rainy taste of Spring! Sorry for the quality – it’s the best we could do through a screen. But it’s enough to see that the yard was wet. V-E-R-Y- wet. Just like the year with snow then rain, the change was plain ol’ weird. After weeks of bundling up in layers just to go outside and get the mail, we suddenly only needed short sleeves and rain jackets. 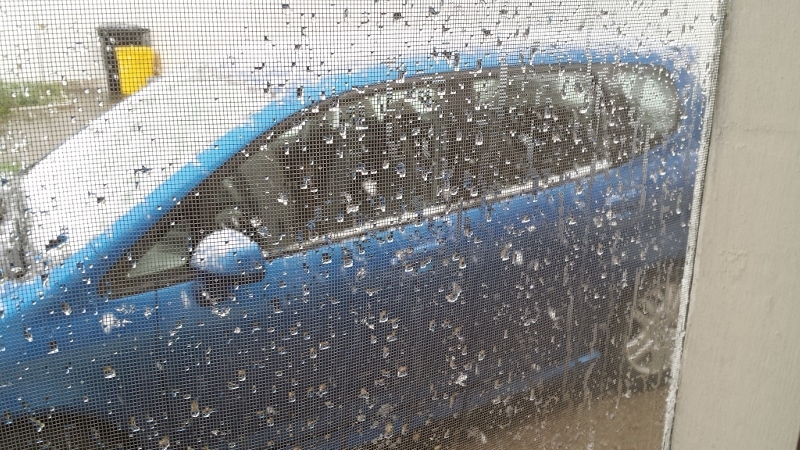 It rained pretty steadily this past Saturday into Sunday, and Sunday was an all-day affair. The temperatures well reflected the goings-on, especially when we hit a tropical 65 degrees on Sunday! As of today, we’re back in the 40s, which seems normal. But Springtime is once again on its way back, as we’ve been promised more days ahead in the 50s and 60s…and more rain is likely, too. If rain is good for anything, it’s staying inside to plan to garden! We’ll talk a bit more about that next week. Oh, and a new batch of seeds just arrived, so maybe we’ll get to them too. In the meantime, all this rain has brought about was looks like a new roof leak (hopefully not though *fingers crossed*), so maybe we should see to fixing that while it’s still dry. Time to get out the tools! As predicted, this past weekend was pretty much a wash. The weather folks all said that it was going to do nothing but rain on Saturday, as well as Friday night and possibly sometime on Sunday. While we don’t know what happened Friday night because we were sleeping, and though we did get a passing shower on Sunday, Saturday was all rain, all day. So, no planting or transplanting happened. However. We still had a pretty productive weekend. That was all on Saturday. On Sunday, after getting off to a really chilly start in the morning, things warmed up significantly in the afternoon. With the sun brightly shining, we had to get outside and do something, at least. The ground remained super soggy and the planting beds were cold and muddy, so there wasn’t going to be any planting happening. Instead, we opted to start replacing the netting on our cages. Of the four that we made, three of them had been chewed through by our resident rascally rabbits, and on all of them, the netting was falling apart in some manner. So we got out the replacement netting and all the cable ties were could fine, and got to work. It’s not obvious, but this cage has all-new netting. In the end, we only had enough ties to complete one cage, but it’s the most important one: the net around the pea bed. If we discovered on thing and one thing only, it’s that rabbits l-o-v-e pea shoots. We actually had a few growing from seeds that we threw in the bed last month, but they had been summarily eaten. The fact that the rabbits could hop right through the cage didn’t help matters any, so getting to that cage first was the priority. Thankfully, we had just enough cable ties to do the trick. The others will have to wait another week until we can get some more ties. 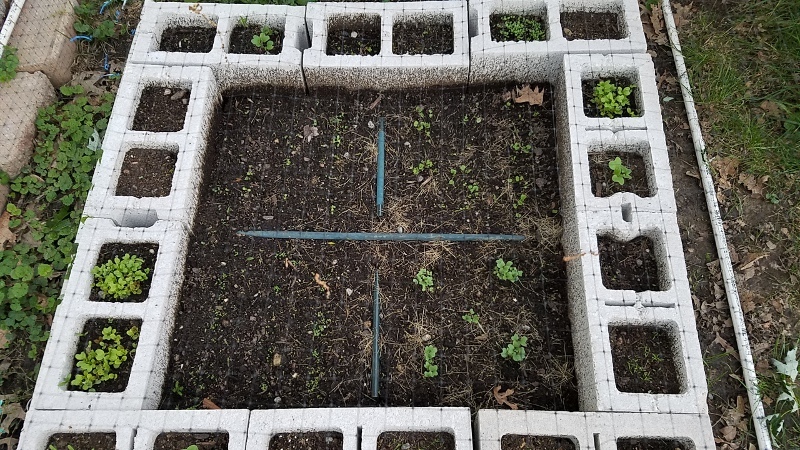 They aren’t as much of a priority, because it would seem that maybe, just maybe, the concrete blocks have kept the rabbits at bay Our greens and lettuce beds are actually showing signs of life, and that life hasn’t been nibbled at…yet! 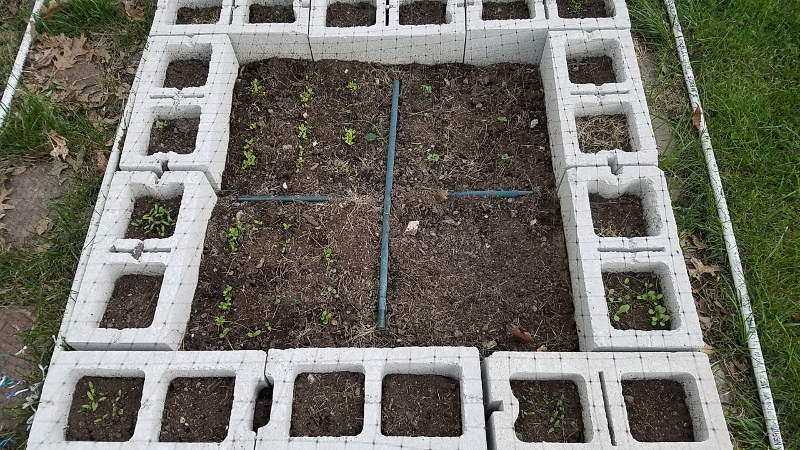 In this raised bed, there’s arugula (top right, bottom left), kale (top left), and romanesco (bottom right). In the surrounding spots we planted a variety of things from lettuces to flowers to carrots to radishes to, yes, even onions! Not sure that it will all do well, but we’ll just have to wait and see. 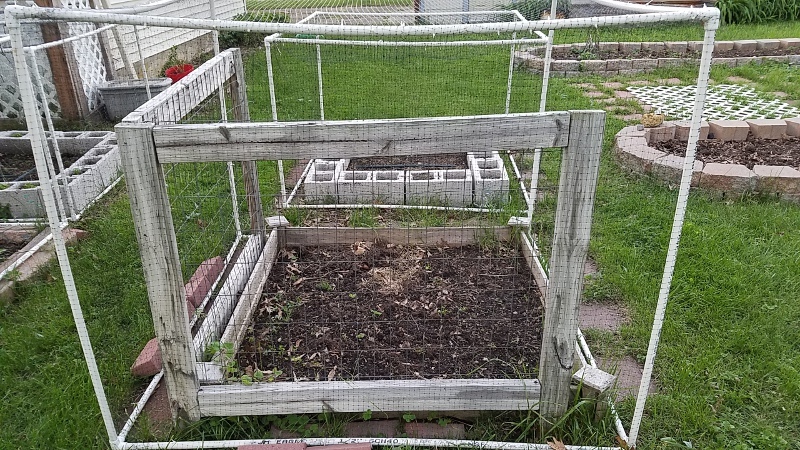 In this raised bed, we planted various lettuces and spinach in the main part, surrounded by more lettuces, flowers, and herbs — basil, thyme, dill, and cilantro. So we’re on our way! 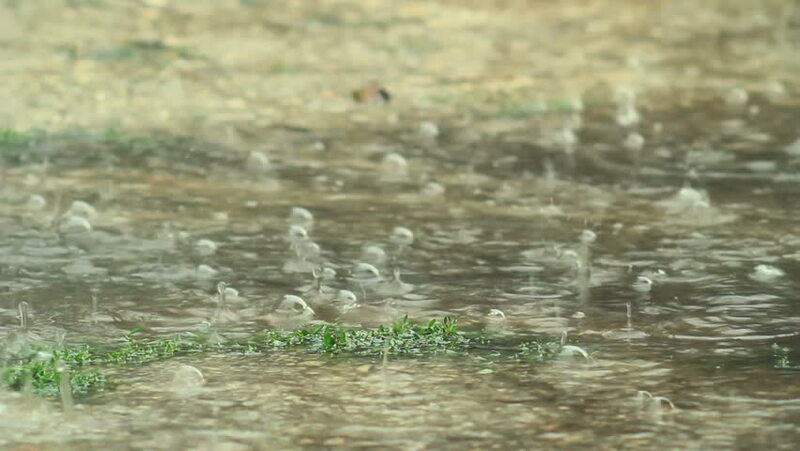 With the drenching on Saturday, we heartily wished for a respite from the wetness, and it seems out calls were answered. This week and weekend there’s no rain in sight…and it’s going to be extremely warm with some days reaching into the 80s and possible up to 90. That’s a bit much for May, but we’ll take it. 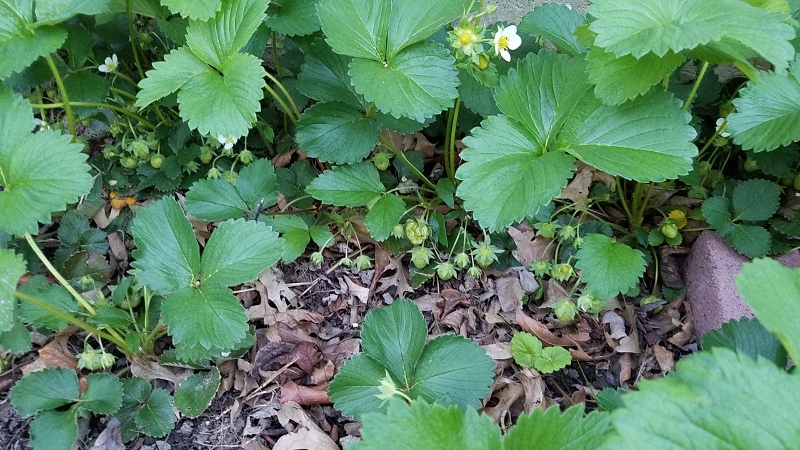 Plus, our strawberries should have a grand time once it heats up. Hopefully the heat won’t be too much, though. The good thing is that it should dry everything out so that we’ll be ready to plant and transplant this weekend. Can’t put things off much longer! 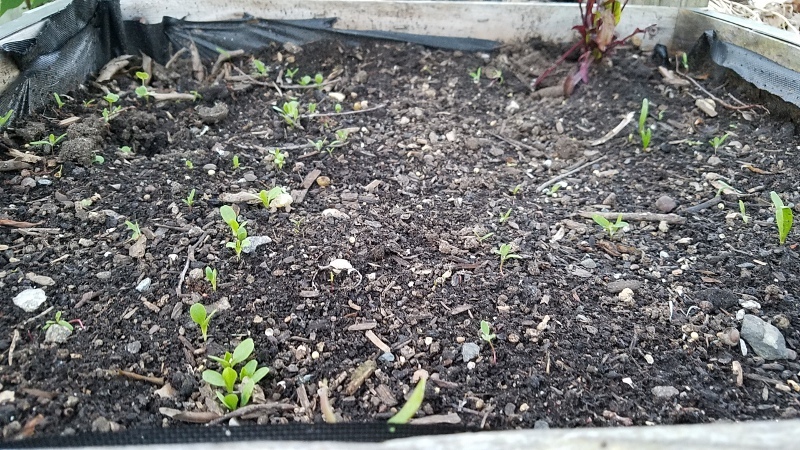 We planted more lettuce in our small hanging — they just started sprouting. 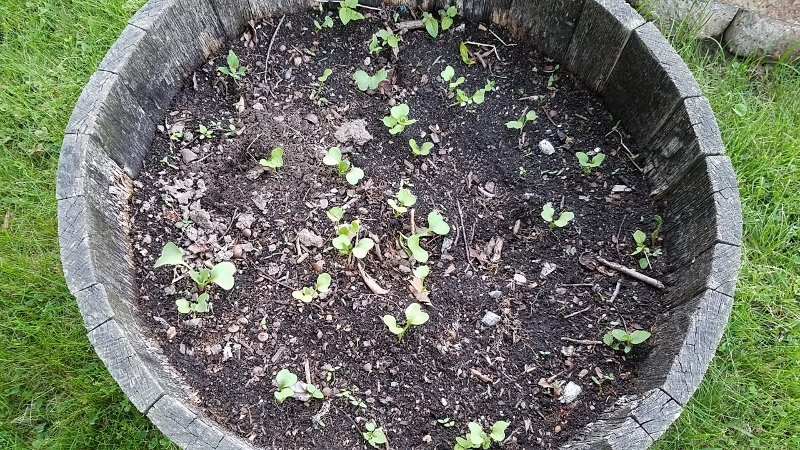 The radishes in our barrels are coming along nicely, and that’s despite the fact that we forgot to cover them with netting. Thankfully, the squirrels and birds haven’t dug in them too much. 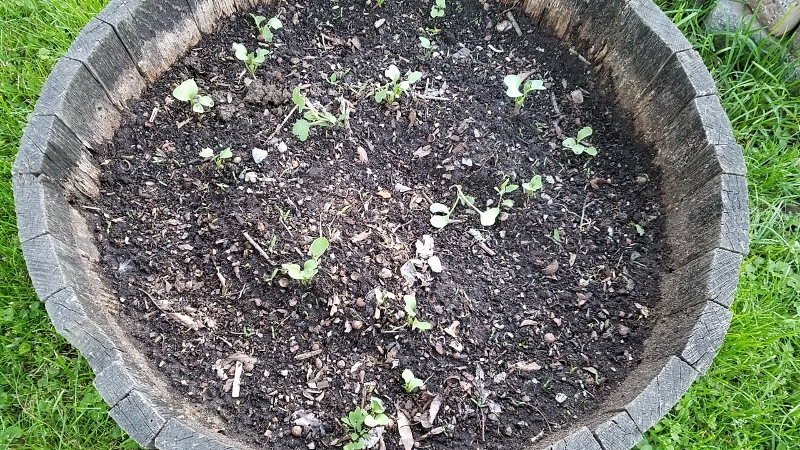 This radish barrel looks a little more promising. We’re just a couple weeks away from strawberry season! Hopefully the warm temps this week will prompt ours to grow and ripen. We were really lucky this winter. Like seriously…lucky. Ye ol’ Farmer’s Almanac predicted that we’d have a winter that was “ice cold and full of snow,” or some such. Well, the snow didn’t materialize. And thankfully so. In fact, of the two major winter storms that we endured, the snow totals ended up being far less than predicted totals. And while we did experience a few pockets of very cold temperatures over the winter months, we found ourselves reaching for sweaters and blankets far less often than we expected. So maybe the Farmer’s Almanac doesn’t know everything? Or…that’s what we thought until we looked at the weather predictions for our area for April and May. In two words: rainy and warm. While we like the second word, that first one is both good and bad. Just a few days ago, we were drenched by a large storm system over our region for the better part of a day. 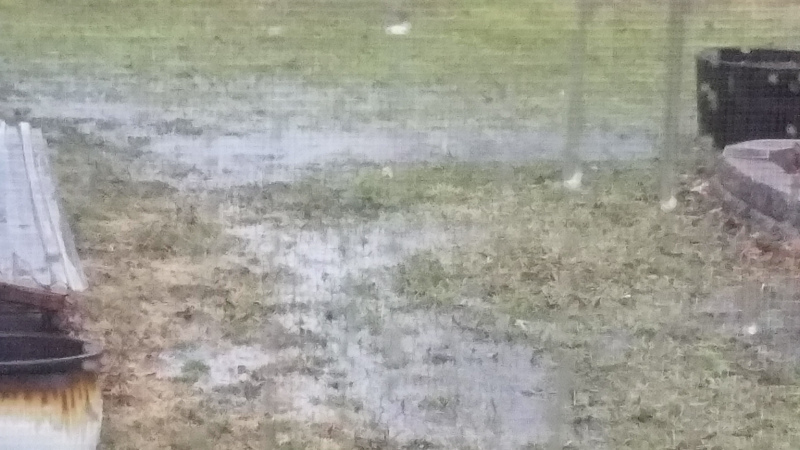 It effectively turned our backyard into a pool. Or, we should say, a series of pools. There are three or four sections of the yard where water simply collects. 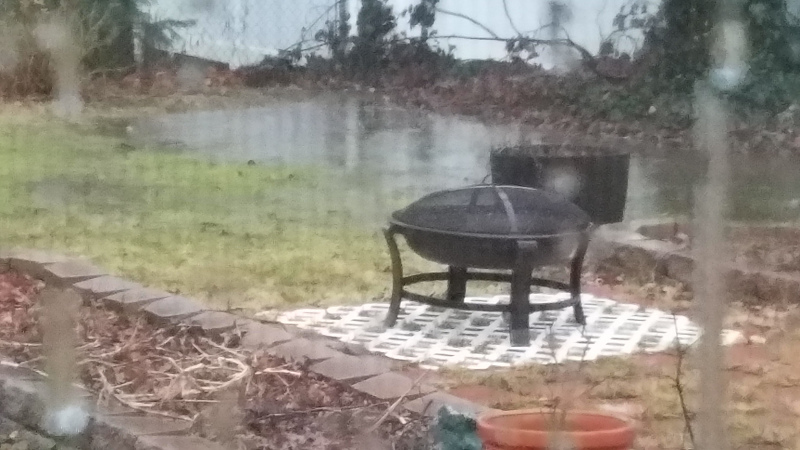 At the height of the storm, we could have easily gone wading out in the yard. Also, we just have to ask…why does it only seem to always rain on the weekends? Surely Mother Nature knows by now that the only time some of us can get out and do stuff! Anyway, it’ll be really interesting to see if the almanac’s idea for our Spring pan out. Right now, it’s warmer here than it should be. That’s not necessarily a bad thing, though will it last? Last year we experienced a terrible cold snap right during transplanting time at the end of April, which was just no good. If things are warmer this year, that’ll be good. But if it gets too warm too fast…? Plus, what it rains too much? (Can it rain too much in the springtime?) Are we asking too many questions? (Probably.) Spring is the one time of the year when we really just have to get go and go with the flow. Literally! If April Showers Bring May Flowers, What Do April Snow Showers Bring? Hopefully they are harbingers of success, because that would be perfectly okay! Instead, they felt like yet another factor delaying us from getting outside. Bad weather from earlier last week didn’t give much hope that the yard would be dry enough to work in, and then snow and rain on Saturday (plus diving temperatures) sealed the deal. 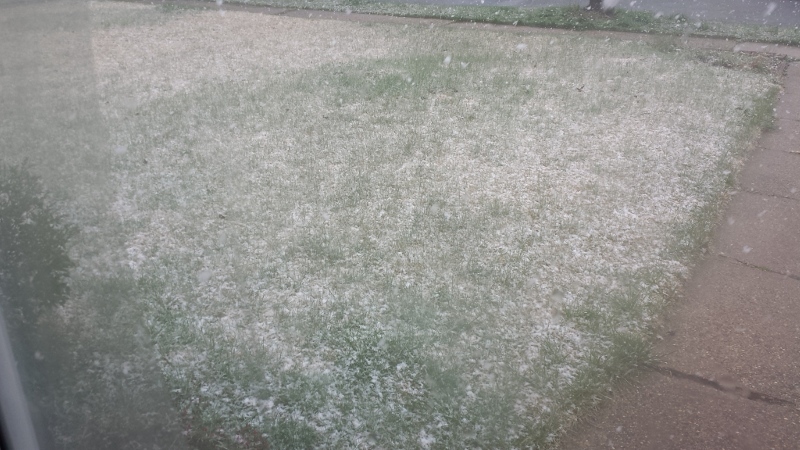 It started out innocently enough, and then the flakes turned big. Like big enough to see streaking by the windows. 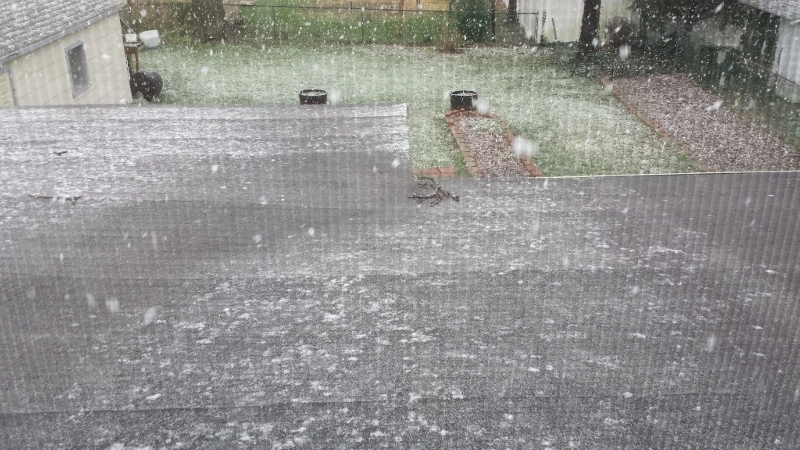 Okay, so we really only got rain for most of the day, but in the early afternoon, the snow started. Seemed a nice, big cold front had stalled over our region, bringing flurries-turned-GIANT snowflakes for a couple hours. 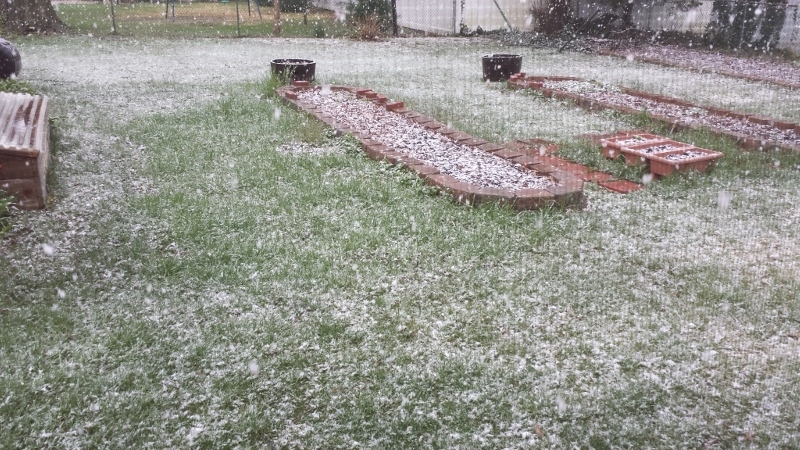 But though it snowed, we didn’t think it was warm enough for the snow to stick…until it started sticking. We don’t get April snows very often round here, so it was mostly just amusing once the snow started to accumulate. A far away view of the yard from one of our upper-floor windows. Seems we have some sticks to clear off the roof. 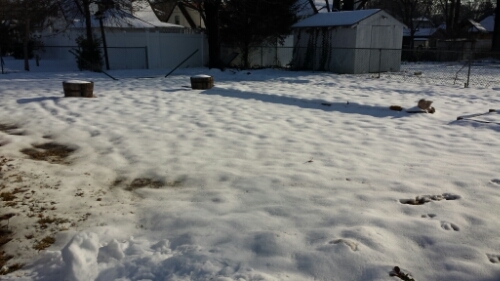 A very nondescript, yet snowy picture of the front yard. Since it had been raining before it started snowing, it was hardly cold enough for the snow to really take. And before we knew it, we were back to rain again. Wet, wet, and more wet. So this past weekend was a bust, but indoors, the seedlings are hanging on. It really is looking like we’re going to have a very slim pepper crop this season, as no more of those seeds have germinated. Maybe we’ll get lucky in the next couple weeks. Heck, we’d just be happy to have a nice, sunny, and not-to-cold weekend in the near future, because there’s some weeding and more cleaning to be done. Plus, it’d be great to get some lettuce seeds planted outside before the end of the month. Here’s hoping! Waking up to April…in February? We know that there’s lots of discuss about the garden (our seed orders arrived — yay! ), but we can’t let go of just how strange the winter “weather” has been this year. So we’re going to stave off the seed talk for another week. It’s okay; with an extra weekend here in February, thanks to the Leap Year, we’re going to be starting seeds a little later than we usually might. Plus, with the way things have been lately, it’s hard to tell just what’s going to happen outdoors from day to day. And Spring is still a month off. Folks, has this winter been as strange in your neck of the woods? Because this is certainly the weirdest one we’ve experienced here in NJ. 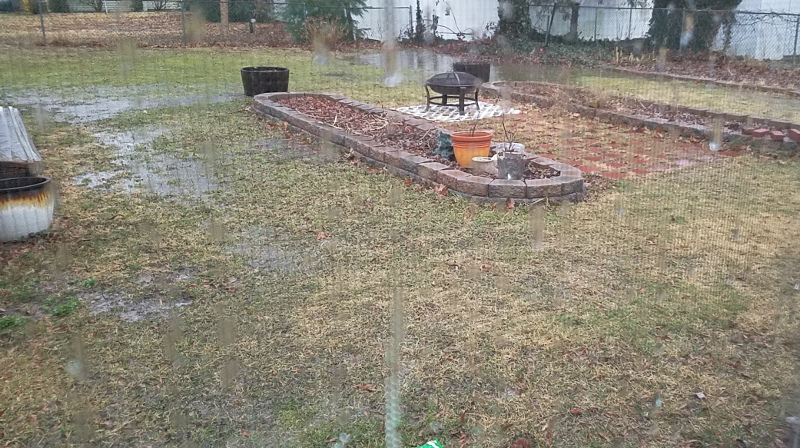 Since the end of December, our yard as either been tundra or swamp. This has wrecked havoc with the backyard, which now has a few choice bald spots. No thanks in part to the squirrels. The regular warm spells that we’ve been experiencing brought them out early over the past few weeks, and they’ve been digging away in the yard, locating hidden treasures. A number of rabbits, too, seem to have come out of hibernation a little early, and they’ve been grazing like a herd of goats. Ah, well. Maybe all this wetness will lead to decent soil quality in the beds. Since we composted most of the dying plants in place late last fall, all the material has been breaking down nicely. In fact, though we’ve yet to do the first proper yard survey of the year, we wouldn’t surprised if we found some early lettuces popping up just because they can. 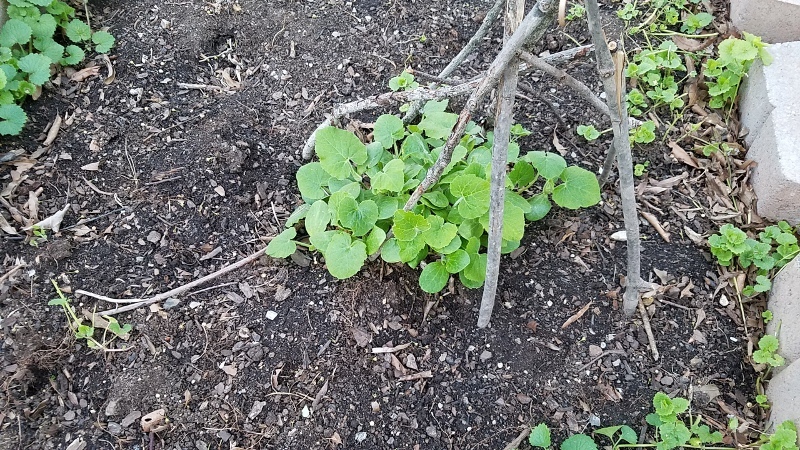 A decent patch of kale has survived this whole time as well. It’s not very tasty, but it lends a nice bit imagination of what’s to come. So while we’re ready for Spring, we actually wouldn’t mind if it just plain, ol’ Winter at some point too. At least it would make things outside seem a little more normal. This past week we did little in the way of garden prep, as we spent most of it simply trying to stay warm! The cold temps of the previous seven days were pretty brutal, and they culminated with a wind chill of a whopping -18 degrees on Friday. And what followed that but a crazy snow storm that dumped a good 6-8 inches on our region. After a series of overestimated storms, this one the weather people definitely underestimated. But adding to the strangeness is today where we reached a practically tropical 43 degrees! Needless the say, what’s left of the snow is dissipating quickly. Looks pretty, but it’s mostly slush. Even though gardening was not foremost in our minds, we have been getting ready for seed preparation slowly but surely. Last year we built a simple frame to hold the plant lights, under which we placed several small tables. 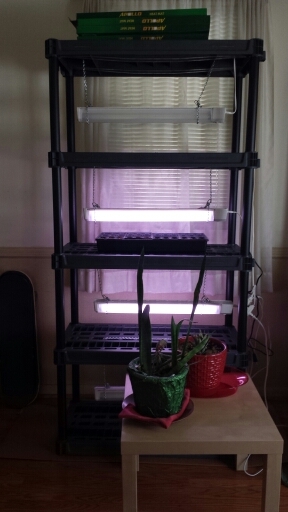 We eventually replaced the small tables with a larger, taller one to get the seeds closer to the lights. It worked well enough, but the whole thing took up a ton of space, and we found a better use for the frame as as holder for our herb planters. This year, we’re opting for a vertical set up, and one that’ll hopefully be a little more friendly in our space. Sorry the image is a little dark, but what we’ve got now is a set of industrial shelves. We suspended each plant light over a shelf with chain. 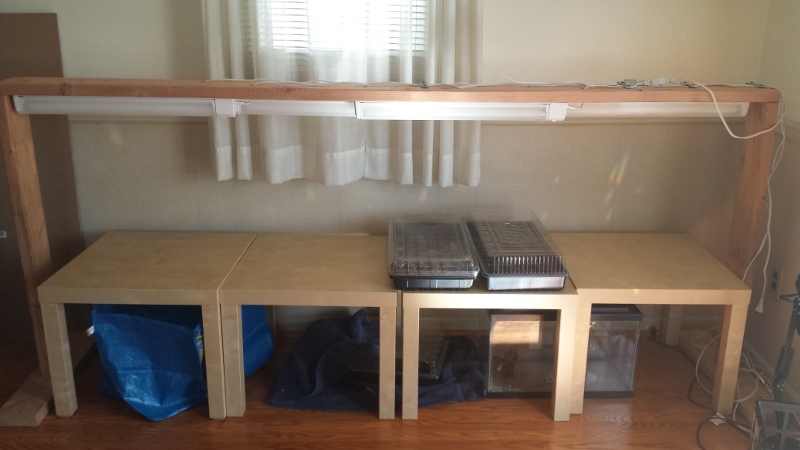 All we need now are some trays for the seed starters, and the set up will be complete! We’re also using heat mats this year to see if we can’t help the seeds along even more (especially since we tend to keep the house on the cool side). According to our planting calendar, we can start the seeds next weekend, which is what were planning on doing, pending any more chilly challenges from Mother Nature.